I love Idaho trout and yesterday, I was in the mood for just that. I also was in the mood for an easy dinner fix and that’s what this was. I sliced some new baby potatoes very thin and added some olive oil and sliced onions plus herbs and put them in aluminum foil which I folded to close. I did the same for some broccoli crowns but you could have used squash, whatever. 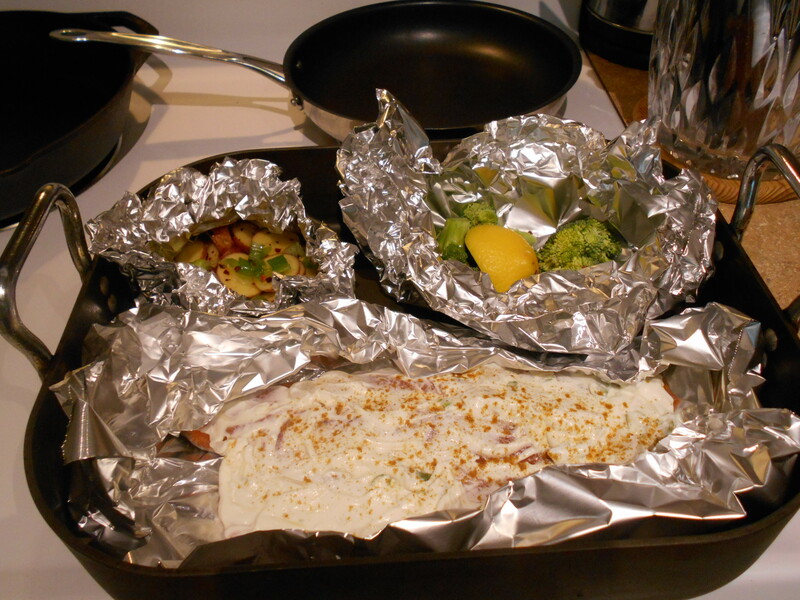 The trout I made as this recipe calls for and left the aluminum foil open. Into the oven it all went and voila, 25 minutes later a glorious meal. I made the trout with the larger amounts written for the sauce but actually wished I had only used 1/2 of the amounts because frankly that was too much sauce for me. So, that’s why I put the amounts of the ingredients the way I did. If you like a lot of sauce use the larger amount and if you are not a huge sauce person, go for the lesser amounts. Place fish in a greased shallow 3-qt. baking dish. 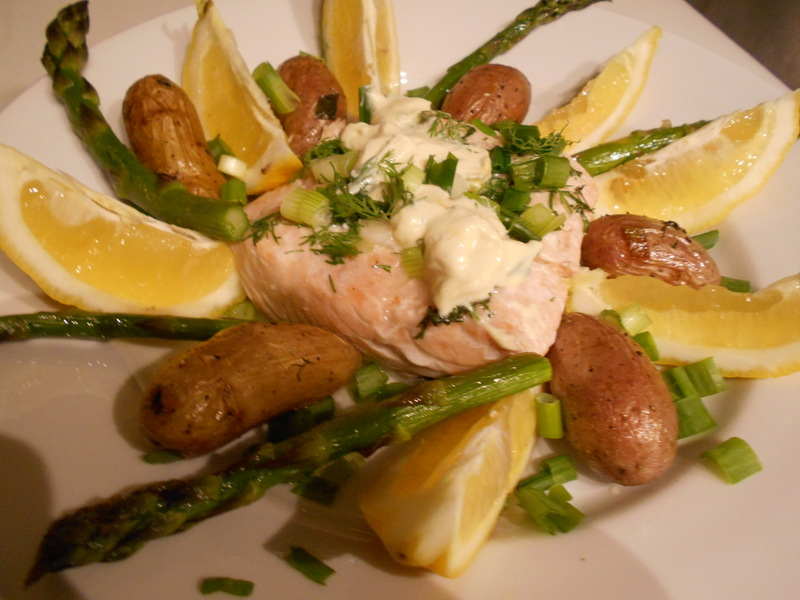 In a small bowl, combine the sour cream, cheese, lemon juice, onion and salt; spread over fish. Sprinkle with paprika. 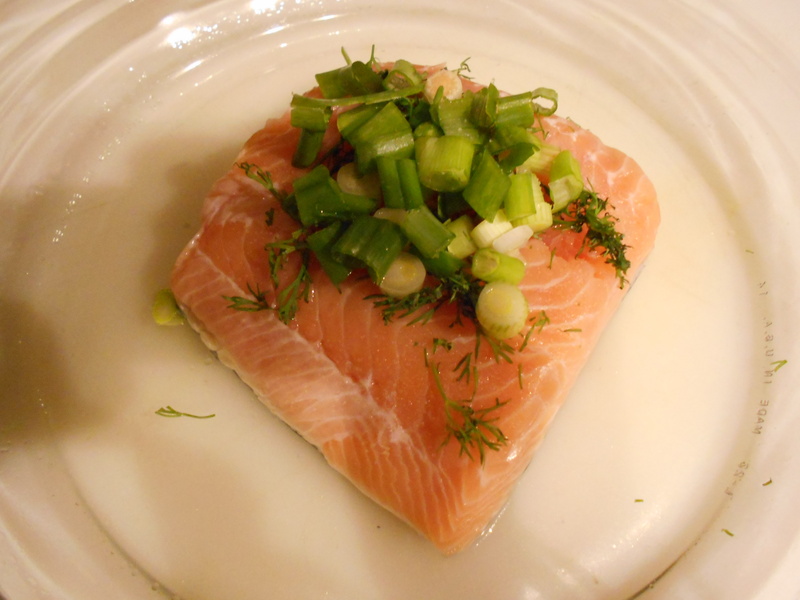 Bake, uncovered, at 350° for 20-25 minutes or until fish flakes easily with a fork. For the toasts or baguette slices: Put an oven rack in the center of the oven. Preheat the oven to 400 degrees F.
Arrange the bread/baguette slices in a single layer on a baking sheet and drizzle with olive oil. Bake until light golden, about 10 minutes. Cool for 2 minutes. Rub the warm toasts/baguette slices with the cut side of the garlic. Set aside. In the same skillet, add the tomatoes and season with salt and pepper, to taste. Cook over medium-high heat until the tomatoes start to soften, about 4 minutes. Turn the heat to high. Add the wine and scrape up the brown bits that cling to the bottom of the pan with a wooden spoon. Cook for 2 minutes. Stir in the stock and cook until most of the liquid has evaporated, about 2 minutes. Remove the pan from the heat and add the tarragon, arugula, mascarpone cheese, and chopped shrimp. Stir until the mixture is creamy. Season with salt and pepper, to taste. Arrange the toasts/baguette slices on serving plates and drizzle with the sauce. Sprinkle with salt and pepper before serving. OK—if you don’t like sea food, don’t even bother looking at this recipe. 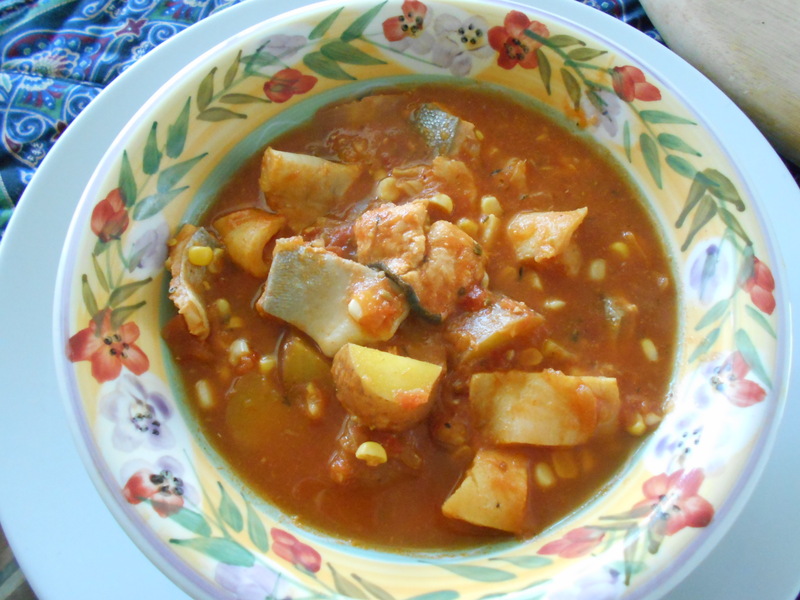 But if you do—well, here’s an uncomplicated (don’t let the 20 listed ingredients scare you) and delicious way to make what many consider the Cadillac of fish stews. 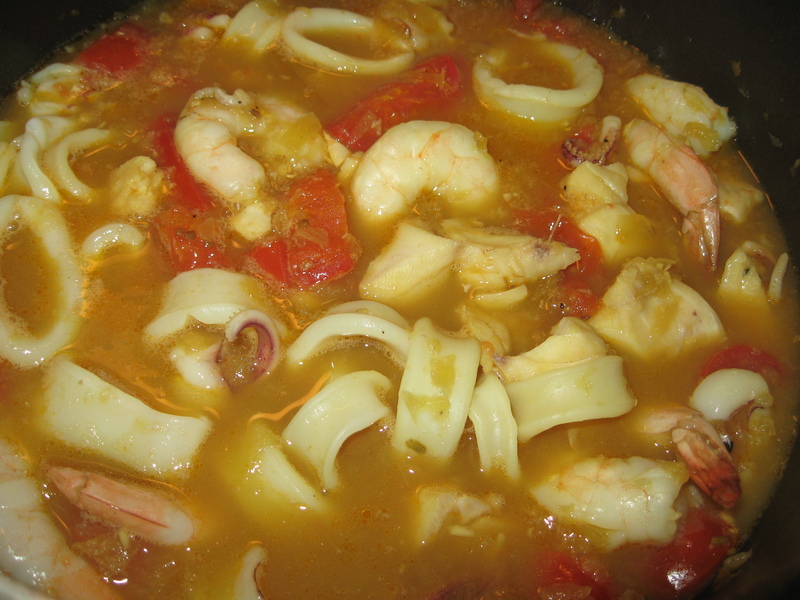 There are so many different versions and recipes for an original and good bouillabaisse; many take hours and a huge amount of various ingredients to make. However, the following recipe results in my opinion in a delicious dish that is not complicated, particularly if you can procure all of the few ingredients that I have mentioned. Please know that you can use fresh or dried seasonings but if you use the fresh variety, it’ll take twice as much of the recipe’s called upon amount as it calls for the dried variety. 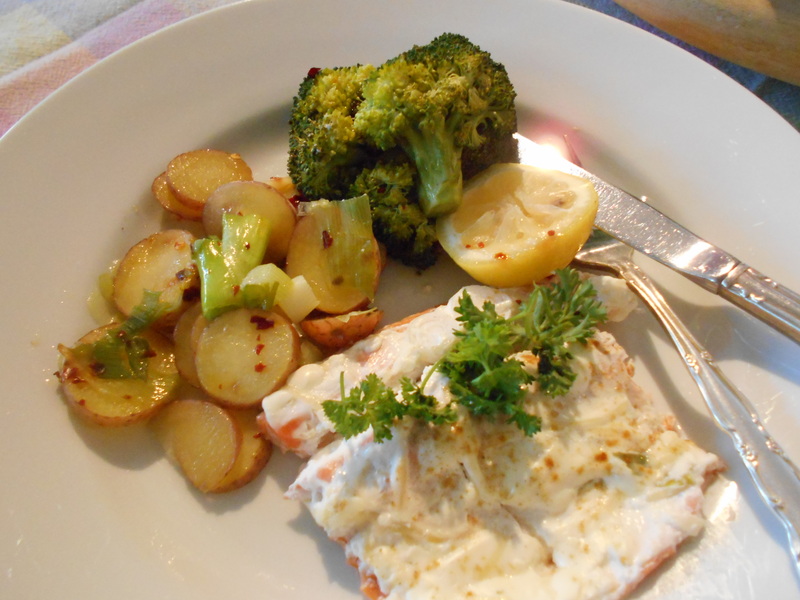 Fish wise, this dish can be a bit pricey to make if you get fresh non-farmed fish from the fish monger, however if you get the frozen variety (and some of it is wild caught) it can be a lot less expensive. So, here’s a dish that you can make fast, fast for guests, for your family or just for your lonesome and then have some delicious left-over’s. 1 medium yellow onion peeled and cut into eighths or if you wish, rough chopped by hand or food processor. 3 large peeled garlic cloves, rough chopped either by hand or in a food processor along with the onions. 2 celery stalks fine chopped by hand or food processor along with ingredient # 1 and #2. One 15-oz. can of whole tomatoes rough chopped if you want bigger chunks or even a can of commercially chopped tomatoes. Whatever, be sure to save the liquid to include in the recipe. 2 -8-oz bottles of clam juice and/ or seafood stock or a combination of both and actually you may want a bit more if you want a “thinner” potage. 8-oz. combination of monkfish, swordfish, halibut, snapper or sea bass cut into large pieces. 10 to 15 whole unfrozen cooked medium sized or could even be small deveined shrimp with or without tail on. Sometimes I think it’s fun to present a dish which people have to actually participate in, ie, taking the shrimp tail off. And actually, some people like to munch on the tail. For last minute topping, freshly chopped parsley or even cilantro. Crusty French Bread to dip into your fish stew. If you wish, you could broil the bread spread with a bit of butter or olive oil and garlic. If your fish, squid and shrimp are frozen, unfreeze them per package instructions. Then add ingredients # 5 to # 15. Also add in the potatoes if you are using them. Stir well and bring to a slow boil. Place a top on the pot, turn the heat down to medium and simmer with a top on for 30 minutes. 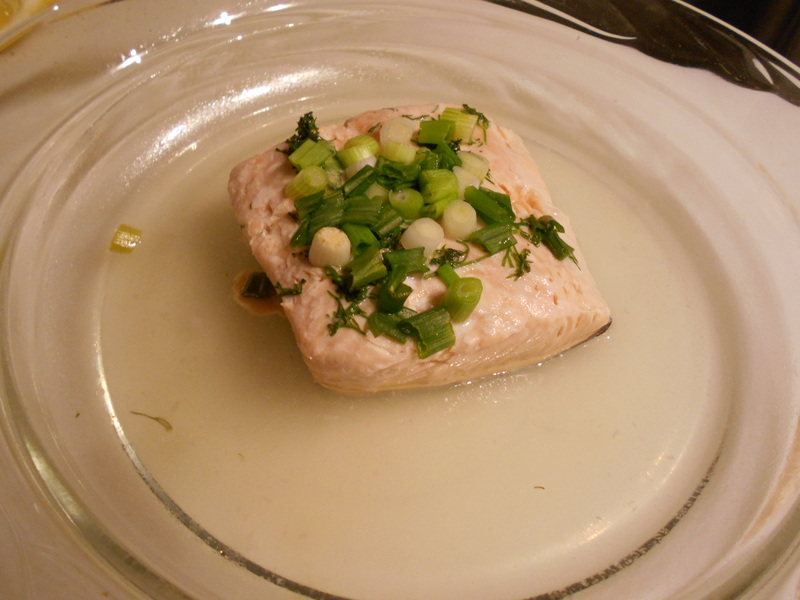 Add the cut fish when the sauce is ready and cook covered for an additional 5 minutes or till the fish is fork ready. For your very last minute or two of cooking over medium heat and with a top on, add the squid and shrimp and the optional corn. You can top this all, when serving, with additional freshly chopped parsley or even cilantro. And don’t forget the crusty French bread and wine, like a rose(accent over the e). 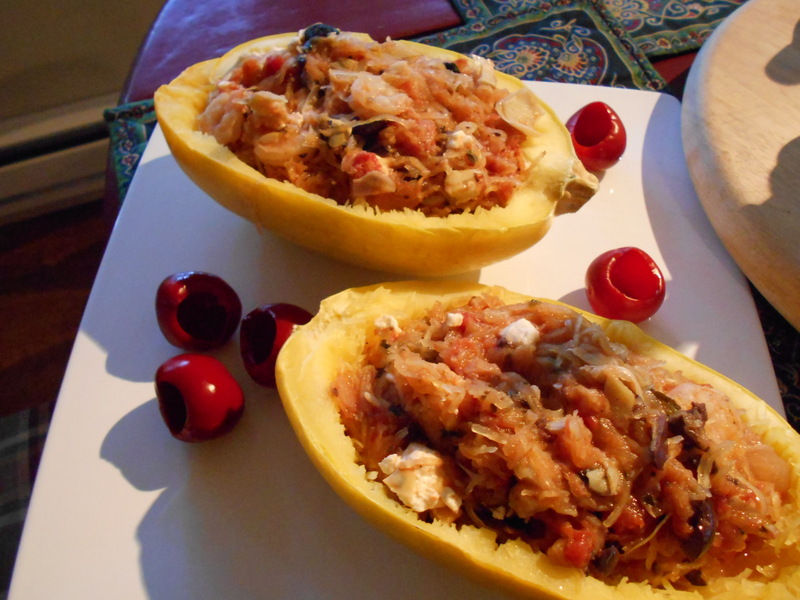 For my taste, this recipe results in a truly delectable dish. It’s a quick and easy one to serve however looks and tastes like you might have spent hours on it. The sauce in particular is divine. 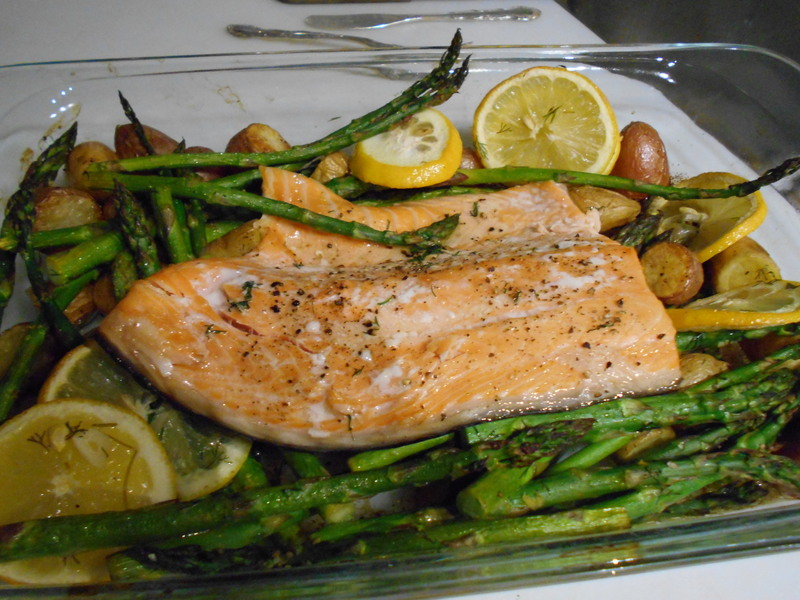 You can serve it over rice, pasta or with crusty French bread and a nice light green salad. It’s perfect for last minute guests or just for last minute family dinners or even just for your lonesome. 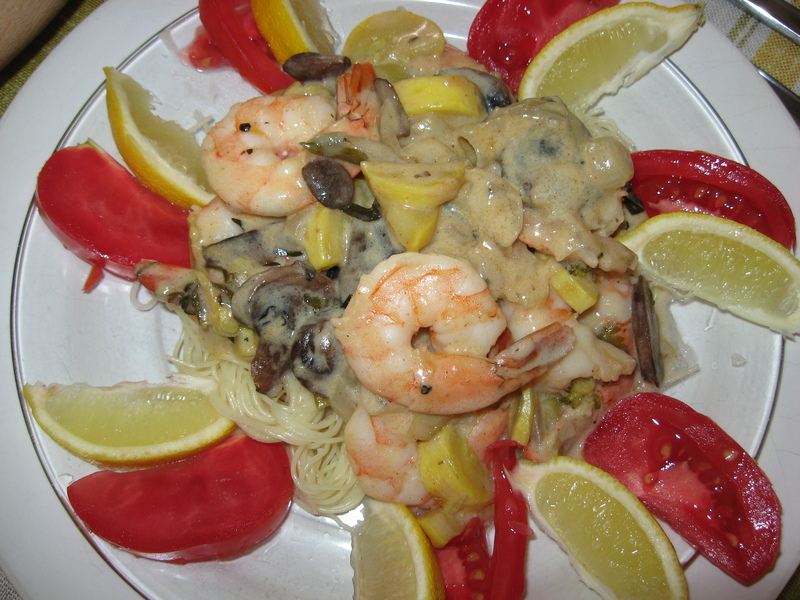 Just make sure that you have some dried mushrooms or frozen pre-cooked mushrooms and uncooked peeled and devinne with tail on shrimp in the freezer. 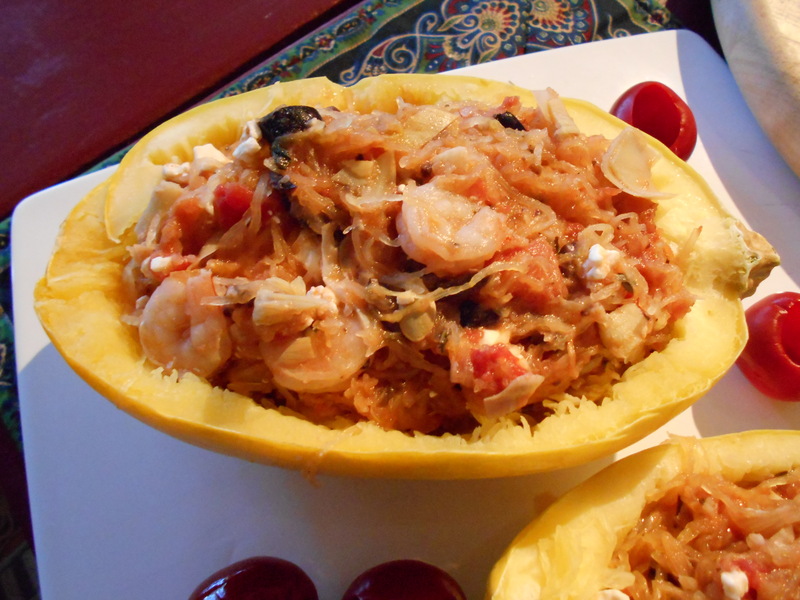 You can even substitute for the shrimp left-over chicken. You also can add chopped light tasting veggies like chopped yellow squash (not broccoli, Brussel Sprouts and such), when sauteing the onions and mushrooms. In a large measuring cup, combine the chicken broth with the white wine, Dijon mustard, and tarragon or fennel seeds, paprika and ground pepper. Let sit while you do the rest of the steps. In a large skillet, heat the butter and/or oil till it is hot. Add the mushrooms and onions/garlic and over medium heat, sauté till the mushrooms and onions/garlic are soft, limp and glistening. Stir in flour till all is well mixed and no more flour white remains. Add the chicken broth mixture and stir till thickened and the mixture bubbles. Reduce heat to medium low. Stir in the cream and shrimp. Cook covered for 2 minutes or till shrimp is done. Don’t overcook or shrimp will become tough. Garnish individual plates or platter with lemon slices and sliced tomatoes and top with parsley or herbs.